A0 print shop format. 25 pages A4/letter tiled for home printing. 16 page instruction book. With this pattern you will learn how to successfully fit a large facing to a curved bag shape, and make a clean. crisp edge on the curve at the top of the bag. You will also learn how to stabilise the wide base of the bag, and how to vary the zip pocket style. with a template plastic base. Vary the strap length by changing the placement of the buttons. Buttons can be functional (with buttonholes) or decorative (just sew the straps together and sew a button over the top. These bags all have free machine embroidered embellishments - instructions are not included with patterns but Ncole Mallalieu occasionally runs workshops in this technique. Join the Mailing List or watch the BLOG for updates. 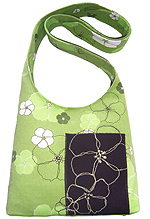 Sheet of template (stencilling) plastic or 15cm VILENE S520 or Fast2Fuse for the bag base.